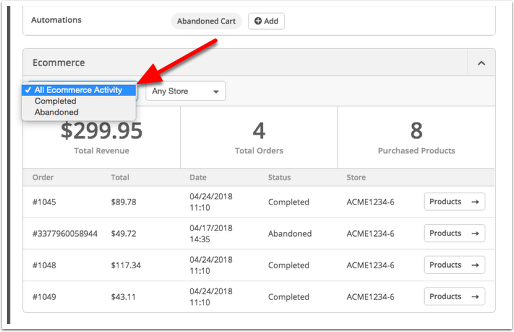 Our Deep Data integration allows you to send actionable purchase and abandoned cart data directly from a Shopify store into your ActiveCampaign account. You can use this data to send customized follow-up emails to your contacts, create list segments, configure automation goals, and more. 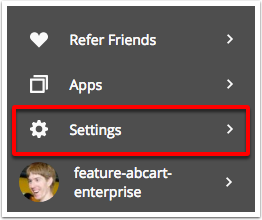 Deep Data integrations are available on the Integrations tab under Settings. 3. The "Connected Integrations" page will open. Click the "Add Integration" button. 4. 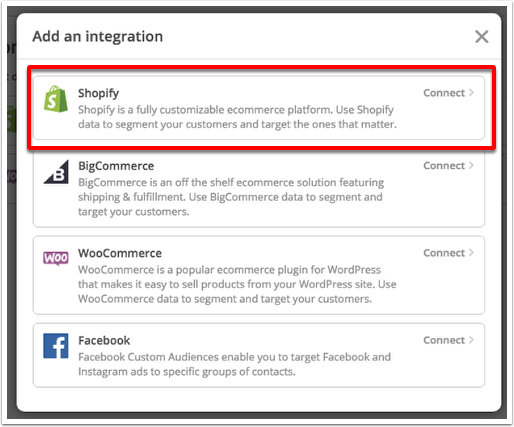 Click the Shopify option from the "Add an integration" modal. 5. Type the Shopify store name into the field provided. 6. Click the "Connect" button. You will be directed to your Shopify store and will be asked to authorize the connection. 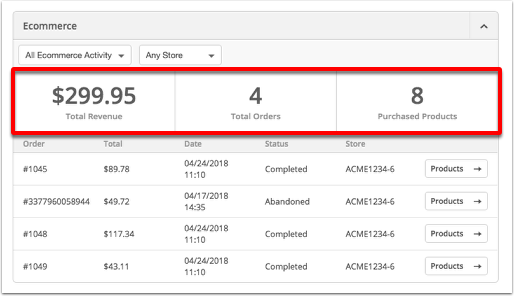 Once your Shopify store is connected to your ActiveCampaign account, all orders and abandoned carts from that moment on will be automatically synced as soon as they happen. 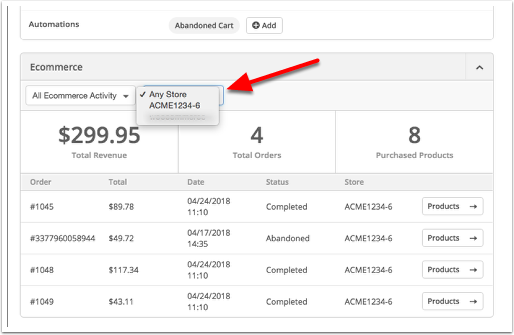 All contacts who place an order or abandon a cart in your connected Shopify store will be added to your ActiveCampaign account—this includes contacts who check the "Accepts Marketing" box and those who don't. In addition, orders of any status for these contacts will be synced to your account as they happen. This includes orders where payment is accepted, pending, failed, and refunded. Then click the "Disconnect" button. Any data already synced from that Shopify store will not be deleted and will remain even after the store has been disconnected. 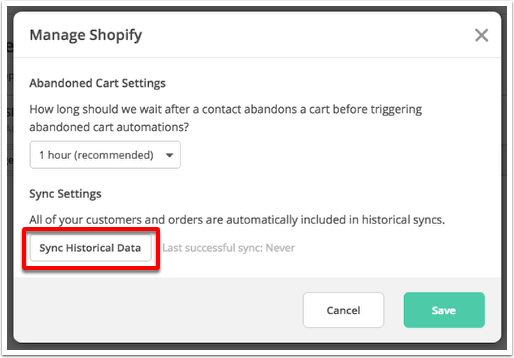 Synced historical data will not trigger any automations to run that use the "Makes a purchase" automation trigger. 3. Click the connected Shopify store. 4. Click the "Manage" button. 5. Click the "Sync Historical Data" button. The historical sync will run in the background. You will be able to navigate away from or close the page. 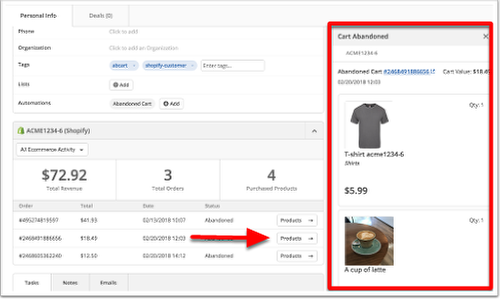 This store filter will only appear if more than one Deep Data ecommerce store is connected to your account. Clicking the Order ID in this detailed view will open the order in the connected Shopify store. While we'll sync all contacts who check the "Accepts Marketing" box and those who don't through this integration, that optin preference will not be displayed on the contact profile page. 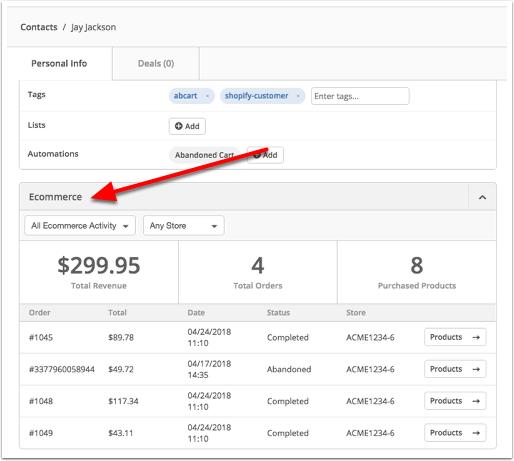 In order to see which contacts opted into marketing through your Shopify store, you will need to create an advanced search using the Ecommerce > Has opted into marketing segment condition. Segmenting conditions for Ecommerce will appear when you're building segments. You can use this data to create "If/Else" conditions in your automation, add conditional content to your campaigns, create goal conditions, set up "Split Test" automations, update a deal score or contact score, send targeted campaigns by creating a list segment, and more. Searches for contacts who did not check the "Accepts Marketing" checkbox. This will include contacts who were not added to your account via Shopify Deep Data integration. Searches for contacts with at least one abandoned cart from any connected Shopify store or a connected specific Shopify store. Searches for contacts with at least one recovered cart (a cart that was abandoned, then completed) from any connected Shopify store or a specific connected Shopify store. Searches for contacts whose latest abandoned cart has the value you specify. Searches for contacts whose latest abandoned cart has the number of items you specify. Searches for contacts whose latest abandoned included a product name that you specify. Use Deep Data personalization tags in your campaigns and automation emails. Doing so lets you dynamically display product-specific content in your messaging. Add a contact to an automation as soon as they make a purchase with the "Makes a purchase" automation trigger. 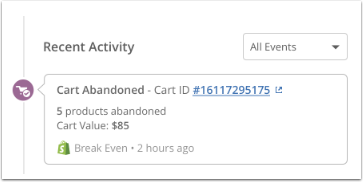 Read about our Abandoned Cart feature and learn how to start an automation when a customer abandons their cart. See which page in your store contacts are visiting with site tracking.